Mountain lions are the most secretive of creatures. By nature, they are generally much more aware of what’s going on around them than other animals, especially people. However, there are couple major clues one should keep in mind that can warn you of their presence – deer vocalizations and cat sounds. Mountain lions scare the poop out of deer, much more so than anything else. Lion presence will cause deer to snort, stomp and even scream. On one occation I was still-hunting during the archery season in California’s Snow Mountain Wilderness. It was first light and I was walking on a dusty trail that traversed through a burn. It was probably a two year old burn and the brush was several feet tall. It held lots of ceanothis that was very attractive to blacktail deer. I remember being surprised that I was seeing no deer and this was prime habitat and prime time. Suddenly, for no apparent reason, deer began to snort on the hillside above me. The deer were panicking and I could hear them running too and fro with no particular logical explanation. The were upwind of me so they could not scent me. I stood motionless and silently waited while attempting to understand what was going on. Standing in a slight drainage, I caught sight of something moving in my direction. At about fourty yards I recognized that is was a square faced male lion walking in a semi crouched position and it was coming directly at me. Mountain lions have the ability to hide and walk at the same time and this was the best example of it I’ve ever seen. Almost moving like a snake down the hill, the cat was unaware of my presence. It was unknowingly going to walk directly into me. The lion jumped into a brush pile about five yards away. Now, still 20 yards from my position, the tables were turned. The cat could see me, but I could no longer see him. In the deafening silence, I concluded it was time to exit. I walked slowly down the trail, keeping my eyes on the bush putting distance between me and the cat. The later behavior was more consistant with typical man-lion encounters. However, lions sometimes give themselves away. That’s a story for another day. Arrived at Mayberry this morning about 9:30 AM. I was amazed at the amount of water on the ground on Sherman Island. Rob is battling cockleburs and he needed me to cut off irrigation of one of our fields. He kills the cockleburs by chopping them and then flooding them up for a few days. The combination seems to work pretty well. You can see that the cockleburs are taller than Lola. We have good crops of swamp timothy, smart weed and water grass in our now-dry ponds so we don’t want to kill off the good stuff. Flooding can also kill the good stuff, but not if we put the water on and off quickly. 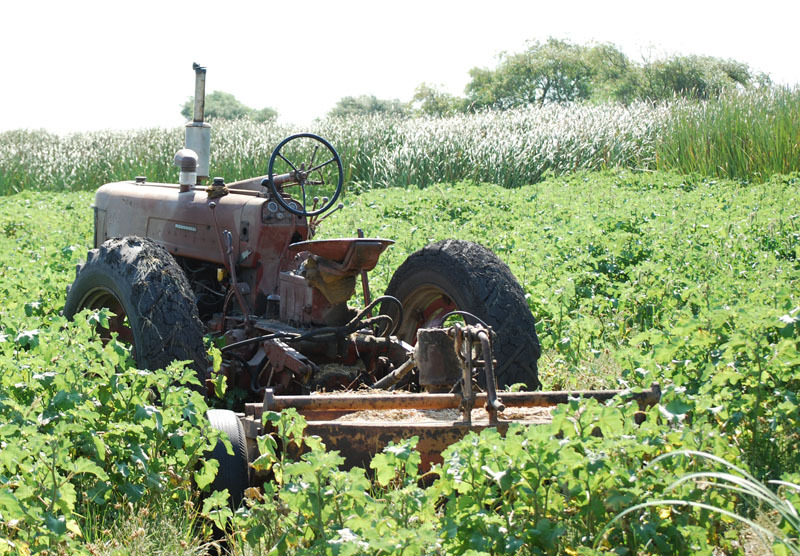 Watergrass only improves with irrigation, but swamp timothy and smart weed can die off with too much irrigation. One of our ponds has quite a bit of water in it from the cocklebur flood up and mallards are using it quite a bit. It has enough cover so you can’t see them except when they are landing or taking off. In the process of chopping, Rob got the tractor stuck. Looks like the pond bottom may be dry enough now so he can get it out and continue chopping. 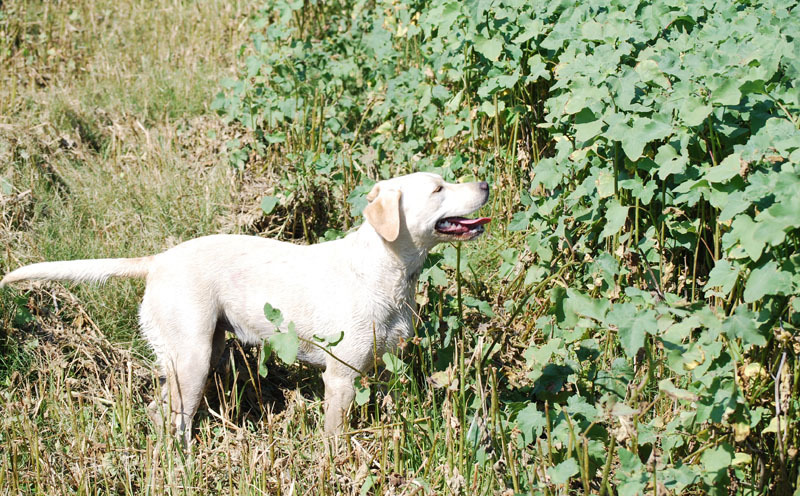 Lola was with me and she got right to work looking for pheasants. I could tell she got a few whiffs and then she got very excited. I urged her on and then regretted it when she came back with a young pheasant. I was surprized at how small it was. Then Lola grabbed the bird when I took it from her and punctured my middle finger – blood everywhere. Oh well. 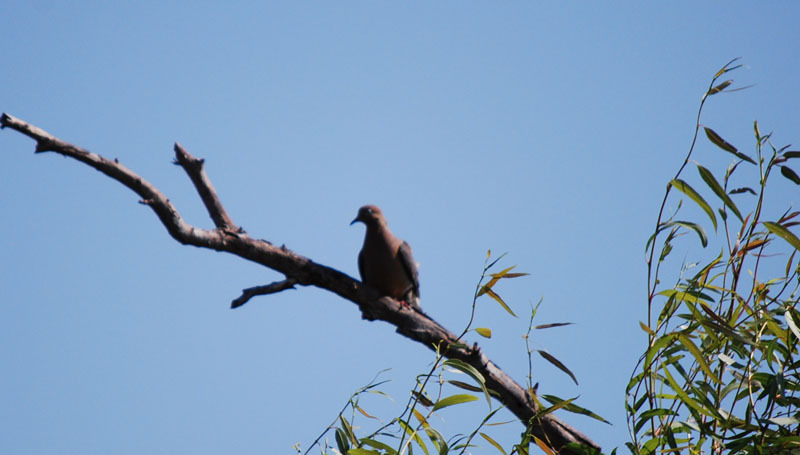 Hope a few of these morning doves stick around until September 1. Had a pretty good dove shoot last year. The jays were active, but not the deer. The deer didn’t seem to be doing much on Saturday morning. That’s not unusual. Between Rob and I we didn’t see a legal buck, but we we’re all that concerned. The season runs for another six weeks and the best days are usually the last two weeks of the season. Rob put a few new locks on some of our gates and put up some no trespassing signs. I was glad to see the game wardens out taking care of business, but was embarassed when I didn’t have my current hunting license in my wallet. Since it was a lifetime license, she let me off with a warning – went home and faxed her a copy of my new one which was sitting in its envelope in my office. 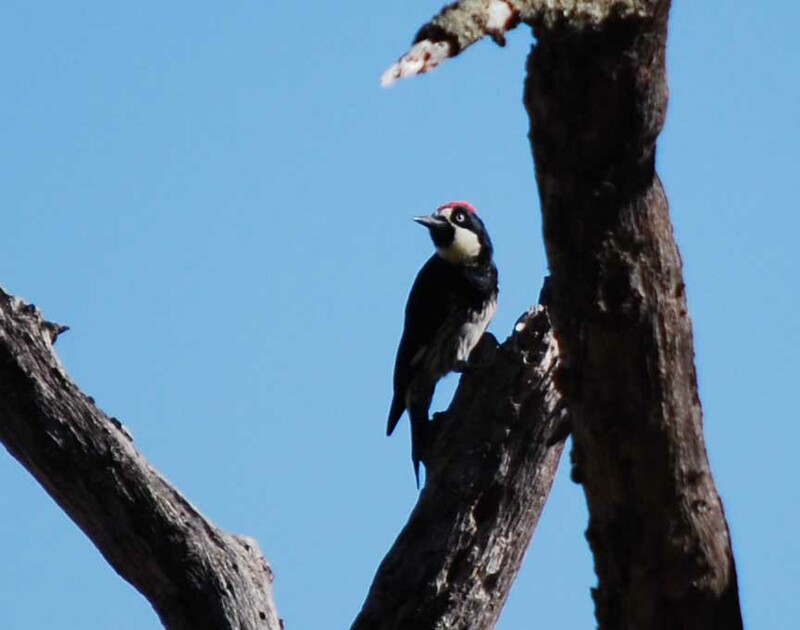 This acorn woodpecker was working the tree next to me. Yesterday SB 1172 died in the California Assembly Appropriations Committee. Authored by Senator Dutton and Sponsored by COHA, the bill died after being placed in suspense due largely to the fact that it would force CDFG to come up with approximately $3M dollars to replace the money it has misappropriated from user-fee accounts that are supposed to be used for wildlife programs. Unfortunately the system allowed this to happen without any discussion. 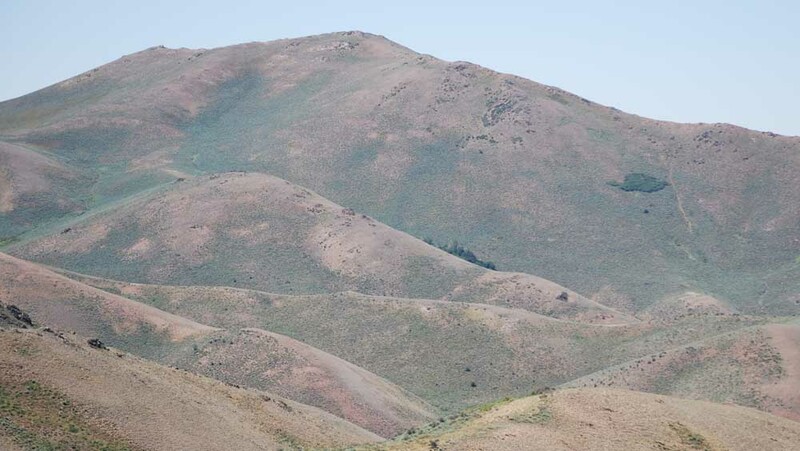 The California Outdoor Heritage Alliance sponsored bill was supported by The Mule Deer Foundation, California Deer Association, Rocky Mountain Elk Foundation, Wild Turkey Federation, California Waterfowl Association, California Houndsmen for Conservation and many other groups totalling over 25 in all. Many of these organizations testified before various Senate and Assembly committees. The bill had received no negative votes with no visible opposition, but some behind-the-scenes pressure from Safari Club International in the form of a letter of concern submitted by SCI President Dennis Anderson apparently played a role in the process. It is clear that this pressure on legislators finally took its toll on the process. It is unfortunate that SB1172, a bill that would have supported habitat conservation, came to a premature end. The bill will be reintroduced again next year and – with a determined effort by its supporters – will have another chance to become law. If it does, it will become very difficult for the CDFG to use the approximately $3M in annual user fees, such as deer tag money and fundraising tag money, for anything other than uses described by current California Code. It is also unfortunate that the California Legislature has saddled the CDFG with unfunded mandates that have put the Administration in a position where it is forced to “rob Peter to pay Paul.” Hopefully, better times are on the horizen. Hard to believe that I could not spot a single deer from this lofty perch on the last day of the hunt. I could see a couple buck antelope in the distance and a little further out approximately 30 wild horses, but no mule deer. 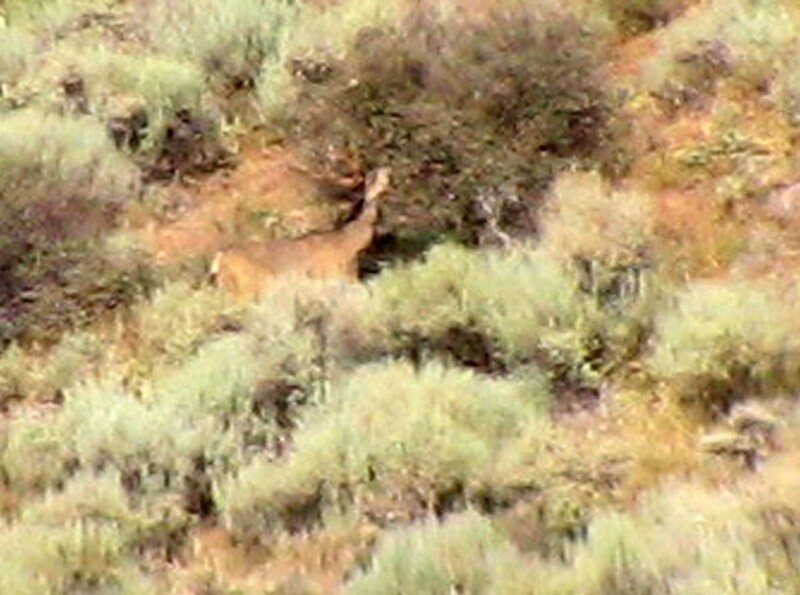 The buck in the above photo was the second largest buck I saw during the six days I hunted. 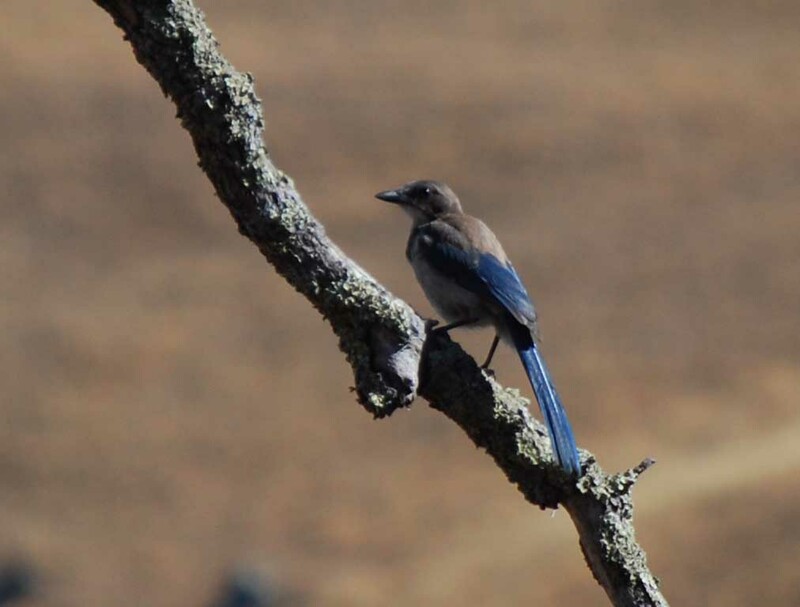 The photo was taken with my Cannon Powershot digital camera through my spotting scope. It’s not great, but it is a photo. This buck bedded under an alder bush where I could have got close, but I chose to wait for another opportunity, hoping something bigger would show up. 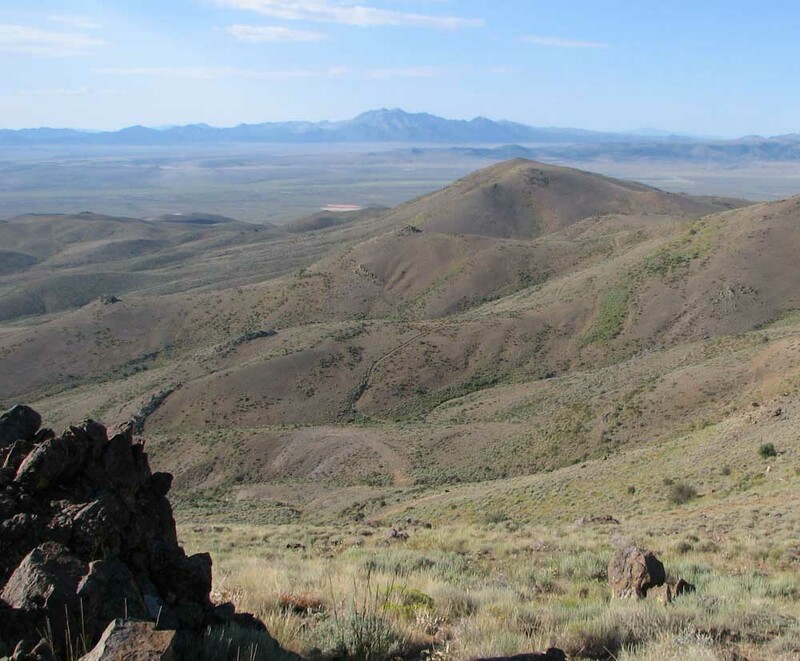 One of the factors impacting the deer herd in Nevada is the fire cycle. Several recent burns have reduced habitat in the area I hunted. 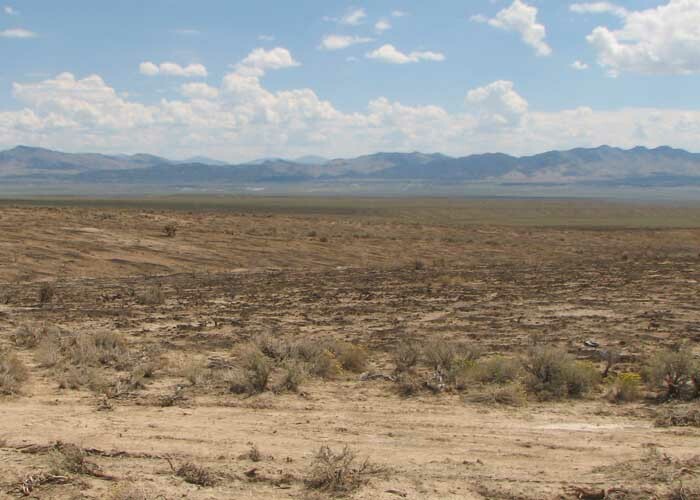 This is a typical picture of what the desert habitat looks like about a year or two after a fire. 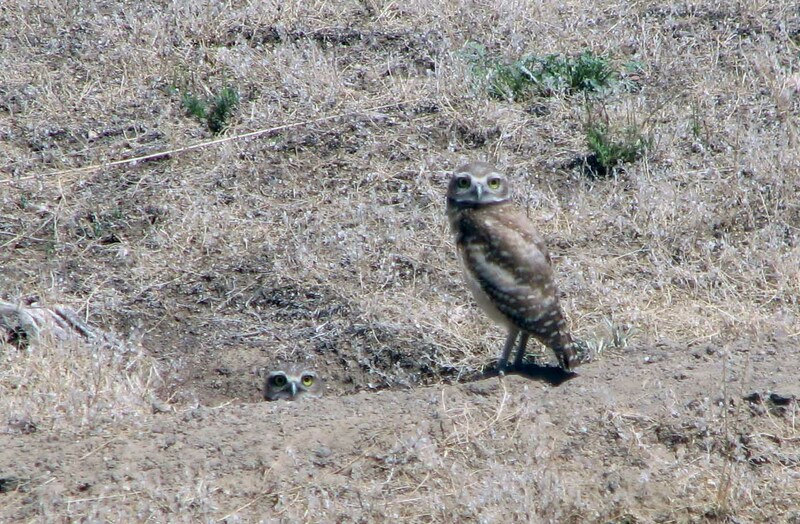 This family of burrowing owls seemed to be happy with the results of last years fires. This is the site of a lighting caused fire that took place last month. The rancher who lives only about a mile from this fire site attempted to put the fire out before it spread, but he was unsuccessful. He told me that he feared his entire ranch would burn, but quick response from neighbors and aerial drops on the fire put it out before it exceeded about 100 acres. An interesting development was that (apparently) aerial seeding of bitter brush has been at least somewhat successful. The burn I surveyed had many bitterbrush seedlings like the one above. I’ll be back again. I’m sure exactly when, but the hunt is not over. Mule Deer – How Big is Big Enough? Conflicted. 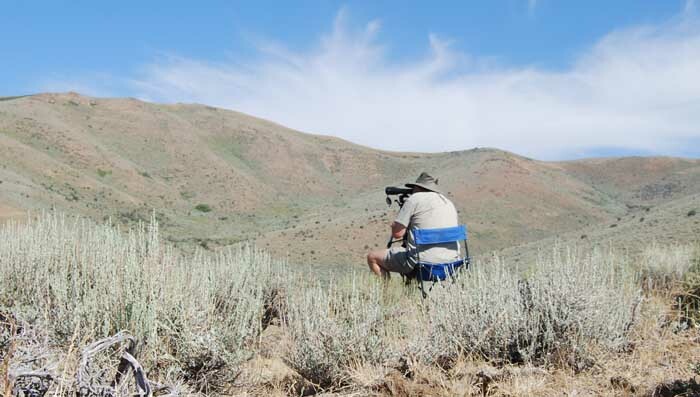 That’s how I often feel when hunting mule deer. I’ve found two or three bucks so far this week that would be my personal best, but I’ve never killed a very large mule deer. I’d prefer to stalk a buck that’s a no brainer, but so far that one hasn’t showed up. A very nice buck climbed over the ridge top when he heard my ATV arriving this morning. I doubt that he ever saw me, but he didn’t wait around for that. Later I spotted a group of four bucks feeding in a patch of serviceberry – the same four I briefly spotted on the first day. It turns out that one of them was a 150 buck with a very nice rack, but I couldn’t get fired up. This doe and fawn fed on serviceberry. Yesterday was a lost day. 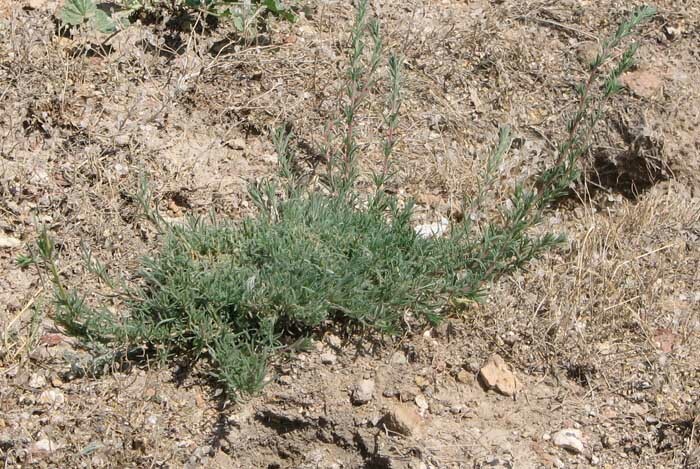 The rancher who owns the property next to where I’m hunting, gave me a hot tip and after a day of eating dust and getting frustrated, all I came up with was a very large burn (nothing but grass and dead junipers for miles) and an active gold mine. Stopped to glass in what appeared to be an out-of-the- way spot and within minutes two big trucks cruised by. I arrived back in my original camp site in the dark, but at least it was peaceful. Saw some other hunters, but mostly it’s quiet out there. 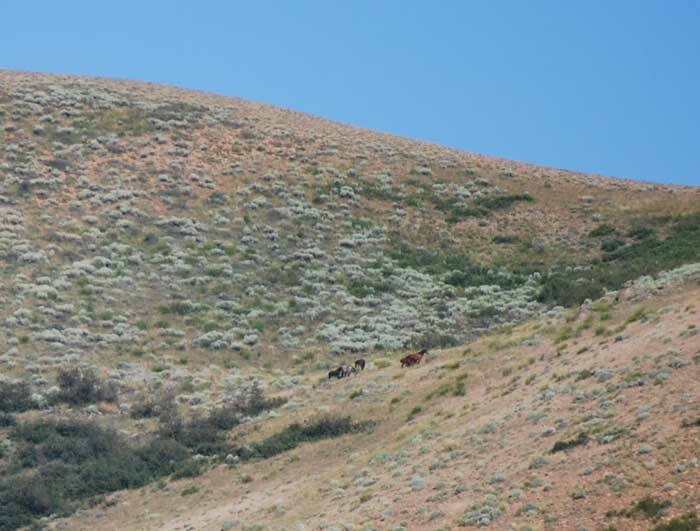 They were camped on a ridge about two miles away. 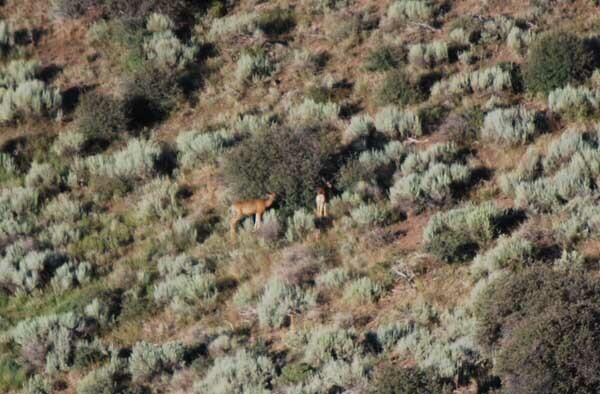 Spotted them when I reached the top of the ridge at about 8,000 feet. That’s almost as high as these mountains get. Got the truck fixed and picked up some better maps at the Elko BLM office. 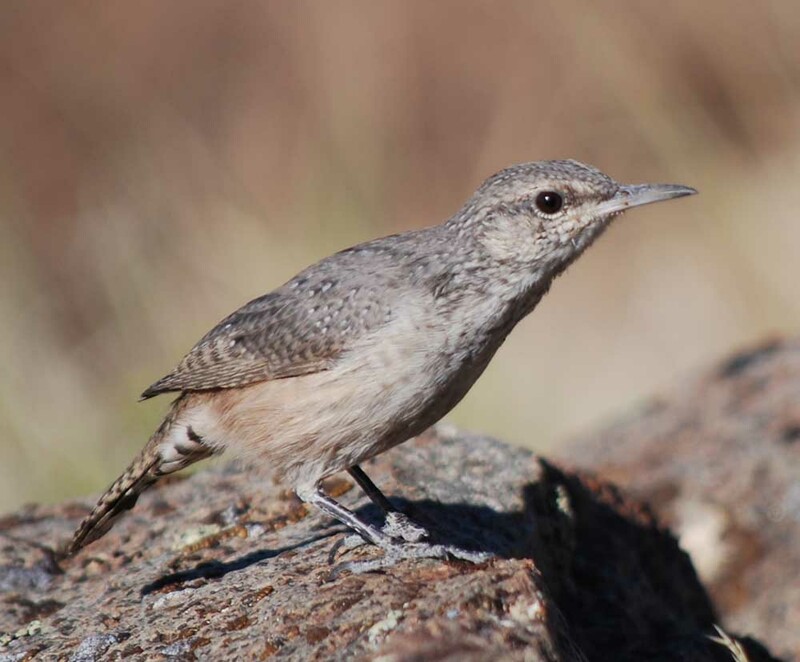 This curious rock wren watched me glass for deer. Still seeing about ten deer each day, but not a wallhanger yet. If nothing bigger shows up I’ll go for a two footer. 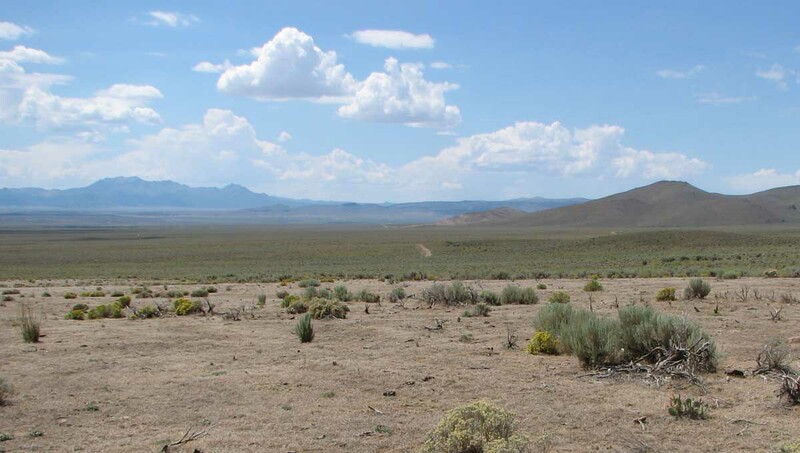 Arriving at an unknown Nevada desert location is always tricky. Add to that, darkness and unmarked dirt roads and outdated maps. Now you’ve got a royal pain in the you know what. After traveling from daylight until dark, I was ready to hit the sack. I thought I was in the right location at 9:00 PM, but couldn’t find a road that made sense, so I drove around for two more hours before giving up. The next morning, at first light, I found the road I was looking for, right where I was looking in the darkness the night before. I carried my chair up to the ridge and found deer in comfort. It was a shame to waste five gallons of precious gas, but at least I was finally here. And it didn’t take long to find some bucks. I was glassing from an excellent vantage point by 7:00 AM. 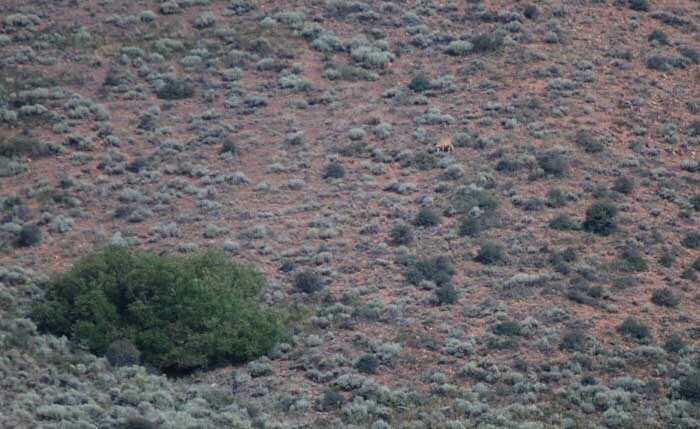 After about an hour – seeing wild horses, antelope, and cattle – up popped the first deer. It disappeared before I could get it in my spotting scope, but I’m pretty sure it was a doe. A half hour later, four bucks appeared in a draw to my right. None looked like anything worth getting excited about, but they bedded down in a serviceberry patch before I could study them completely. About 9:30, a nice buck popped up and fed down the hill about 1,000 yards away. He bedded in the shade of a large single alder. All the bucks bedded in either serviceberry bushes or alder bushes. That was good information. About 10:00 AM I headed back to camp to do some organizing and cook some breakfast. Day two was almost a total repeat of day one in terms of deer sighting. I found a road that will reduce the climb in my effort to access higher ground and also to reach the buck if I decide to go after him. I guess him to be about 24 inches wide with good long tines. I’d guess he’d score between 150 and 160. I’ll probably find something bigger pretty soon, but in the mean time, at least I know where one respectable buck is living. Take my word, it’s a buck. Left home without my coffee pot, so I’m in Elko to make a couple purchases and make this report. Not sure when I’ll be back. No cell service out there, but the country is hospitable.